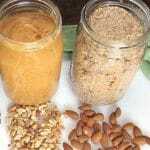 Home Ground Nut Butters: Make these nut butters at home in just minutes with a high powered blender. Enjoy the super fresh taste and eat healthy while staying on budget. Home Ground Nut Butters are delightfully smooth, and awesome for snacks, spreads and baking. I started grinding nuts years ago because my youngest children could only tolerate pecans at that time, and purchasing pecan butter at the market was out of my price range. I source the nuts I use from Azure Standard. They carry healthy whole foods in bulk, which certainly helps with the economics of clean eating. At first, I had my products shipped via UPS, but could only get shelf-stable items. Now there is a drop ship location in town that allows us to pick up our order once a month, including fresh and frozen foods. Thankfully, just this year I was able to upgrade to a larger refrigerator and now have extra room in it for storing nuts. However, in the past I stored my nuts in the crawlspace to help keep them cool. Old popcorn tins or heavy food grade plastic containers work well for storing food items. It’s often the case that you can find tins at thrift stores, especially after the holidays are over. The Vitamix and Champion Juicer both work great for home ground nut butters. Although I like both, the one I use depends upon how much nut butter needs grinding. If it’s only a quart, I usually use the Vitamix. I don’t bother to wash it because my sons blend goat milk ice cream every night, and the added nut flavor is always a nice change. It is easy to add additional oil in the blender as needed when the consistency is too dry. 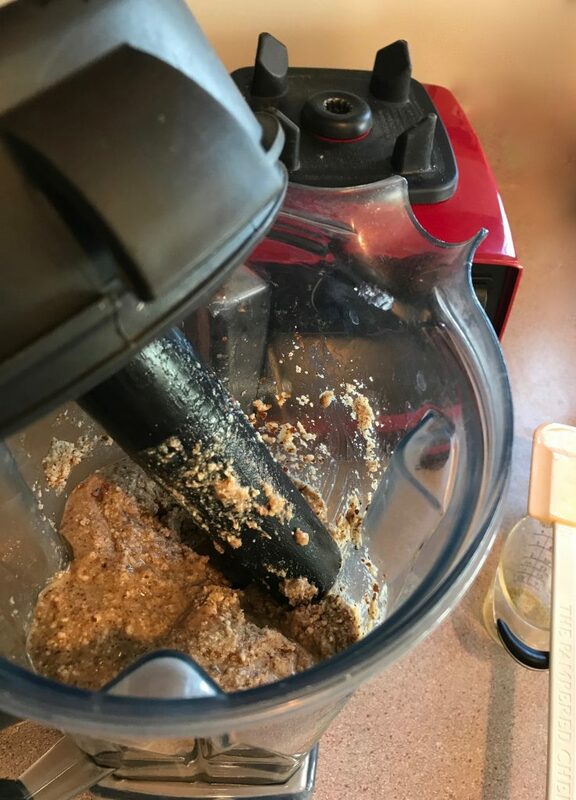 If I am grinding several quarts of different nut butters (like this weekend as I prepared food and healthy snacks for archery hunting) the juicer is my choice. It’s a bit more work when adding oil, but you can sprinkle it in with the nuts in a bowl before grinding. You can also make nut butter in the food processor. The Cuisinart 14 Cup Food processor will handle grinding 2-3 cups of nuts at one time easily and, although it takes longer (15-20 minutes total), the food processor can grind up to 4 cups of nuts at once, so long as you wait patiently until it turns to nut butter. Don’t forget to pin this HOME GROUND NUT BUTTERS to your favorite PINTEREST board for later! 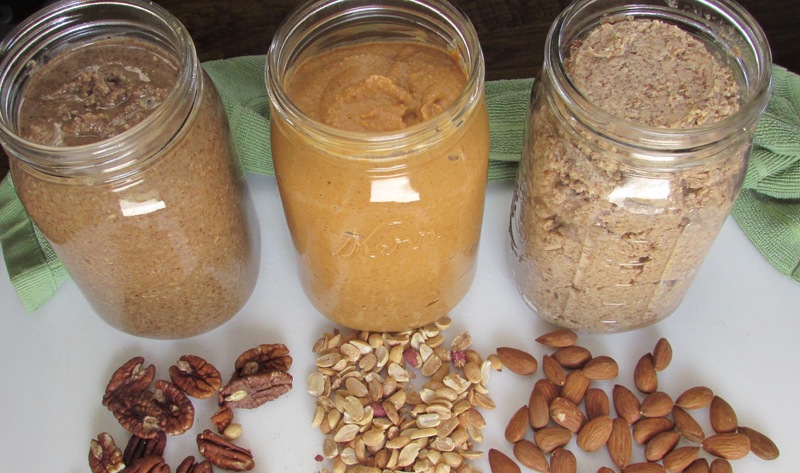 Make these nut butters at home in just minutes with a high powered blender. Enjoy the super fresh taste and eat healthy while staying on budget. Place nuts (and ~1/4 cup oil for almond or pecan butter) into the Vitamix container and secure the lid. Turn on and slowly increase speed to high. Use the tamper to press the nuts into the blades. Add more oil as needed in 2 Tablespoon increments. In about 1 minute you will hear a high-pitched chugging sound. Keep using the tamper to press the nuts against the blades until the butter begins to flow freely through the blades, the motor wound will change and become low and laboring. Stop the machine. Store in an airtight container in the fridge (or freeze for longer storage). Using the solid, blank plate in body hub with the funnel, gently push nuts into the grinder. Catch the nut butter in a jar. If you are using a smaller food processor be sure to decrease the amount of nuts you are grinding so as not to overload the machine. Place nut in food processor, turn on. Grind to fine powder (2-10 minutes) and then add oil if needed. I personally recommend starting with 1/4 cup of oil and increasing in 2 Tbsp increments. Continue processing until it becomes smooth and creamy, stopping to scrape down the sides of the bowl as necessary. Continue processing! The nut oil will release as the mixture continues to warm; it should turn creamy and smooth and move around very easily inside the bowl of the food processor. It may take up to 15-20 minutes until it is totally creamy, this depends on the strength and size of your food processor and how many nuts you are processing. It is okay to add ore oil if needed. You can use olive oil or avocado oil in the nut butters, however, make sure that if you are going bake or heat the nut butter that you use avocado oil (heat stable to 500 degrees Farenheight). Olive oil should not be heated because it oxidizes and produces free radicals. Vitamix Blender: an important and worthwhile investment for preparing food. Stainless Steel Canning Funnel: very handy! Cuisinart Food Processor: huge time saver. Champion Household Juicer: this appliance has a large variety of important uses. 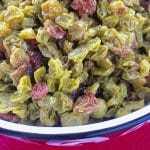 Tasty Homemade Raisins: An easy, yummy snack to make at home with a surprising nutritional punch.